Some writers will pick a single genre and stick with it their entire careers, while others tend to produce a wider variety of works. Looking at my own oeuvre, it’s easy to see I fall into the latter category. Over the past 20 years, I have written plenty of Amish fiction and nonfiction, but I’ve also written mystery novels, dual-timeline novels, and even a how-to book on housekeeping! That’s a lot of variety, something the creative side of me needs in order to flourish. I love to explore, creatively speaking. In fact, if I’d had to write the same types of stories in the same genre for every single book I’d ever done, I’d have gotten incredibly bored. Like I said, variety. Apparently, there is something about this phenomenon that stirs my creative interest enough to shape entire novels around it—yet it took my husband to point this out to me. It happened a few years ago, when I first told him of a new series that Leslie Gould and I wanted to write, about a family of Huguenots forced to flee from France under the threat of religious persecution. In that moment, it struck me how right he was. The Amish were also victims of displacement, forced to leave their beloved homelands in Europe and head to America in search of religious freedom. Many of my Amish books have dealt with this very topic, weaving their tragic history in and among their stories. Then there were the Huguenots of France, who were protected for a time under a royal decree that allowed them to worship as Protestants rather than adhering to the state religion of Catholicism. But when that freedom was later revoked, the Huguenots were forced to convert to Catholicism or face punishment, imprisonment, or even death. As many as 400,000 Huguenots fled France, relocating to Protestant countries in Europe, South Africa, and North America. 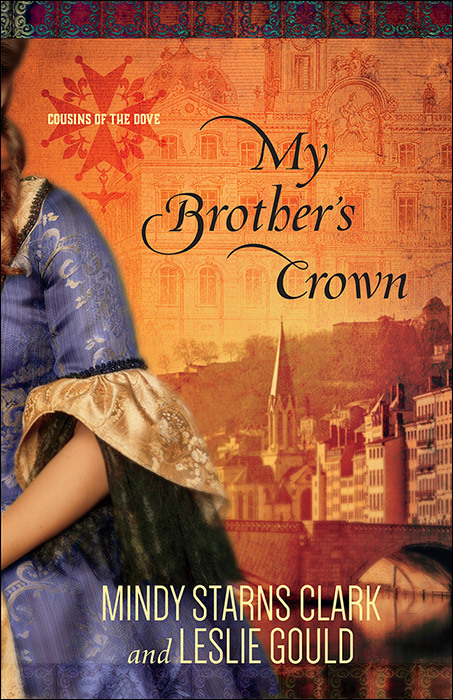 Our first novel in this series, My Brother’s Crown, is set in 1685 and focuses on the Gillet and Talbot families of Lyon, France, who are part of this great diaspora and end up in England. 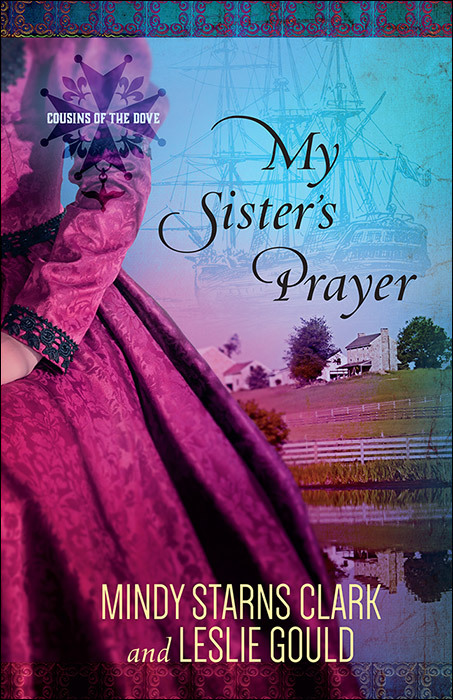 The second book in the series, My Sister’s Prayer, picks up their story with the next generation, as they emigrate from England to the New World. In both books, the characters are forced to leave behind all that they know and start life anew elsewhere. So why am I drawn to stories like these—tales involving people groups that have been forcibly displaced? If I had to guess, I’d say it ties back into my most common recurring theme, that of isolation and longing for community. I can imagine no greater isolation than that of those who’ve been sent from their homes and towns and lives and everything they’ve ever known only to resettle somewhere foreign and strange and new. I can also imagine the incredible sense of connection and community as small clusters of these people groups clung together to establish new homes, new towns, and start over again. We all have “people groups” to which we belong, from small (“I’m a member of a book club”) to large (“I’m an American”) to everywhere in between (“I’m a Shih Tzu lover,” “I’m a Southerner,” “I’m a Broadway aficionado,” and so on). You have them too. Even the fact that you’re here right now, reading this article, makes you part of a people group. You’re a lover of Amish fiction or, even more specifically, you’re a part of the AmishReader.com family. Participating in this wonderful place, discussing your enjoyment of a specific genre with like-minded people, hearing from familiar authors who share your enthusiasm—these are things that create community. And community is something that we all need, whether we have to find it anew after being forcibly removed from our homelands or we simply have to seek it out in the stable, safe environments in which we have always lived. Either way, God designed us to need others, and in seeking community we acknowledge that need. In finding community, we begin to fulfill it—and that’s the stuff that novels are made of. Or at least my novels, apparently. Considering the vast number of displaced people groups throughout history still left to explore, I’m sure this is a topic I’ll be revisiting again—though perhaps with a bit more intention next time. 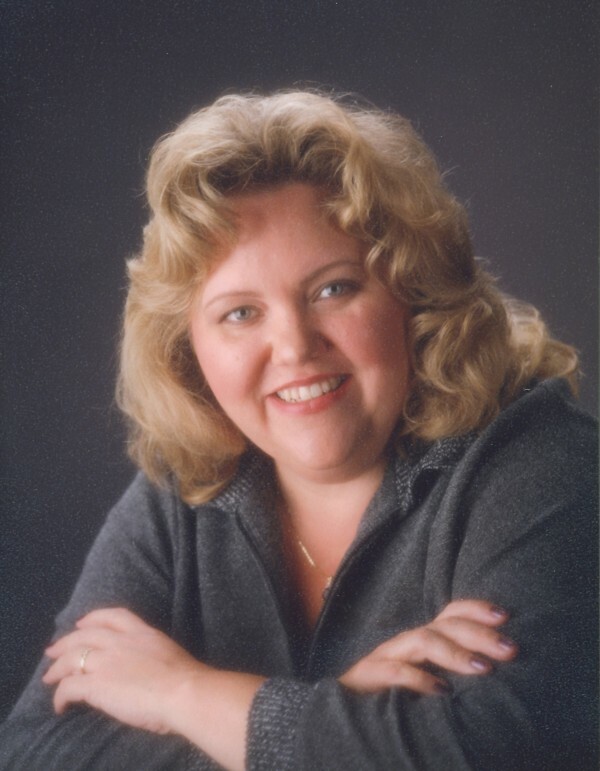 Mindy Starns Clark is the bestselling author of more than 20 books, both fiction and nonfiction, with over a million copies sold. Mindy and her husband, John, have two adult children and live in Pennsylvania. Visit her online at www.mindystarnsclark.com. ***Want a chance to win one of three copies of My Sister’s Prayer? Enter the giveaway using the form below! Fine print: This giveaway is open to US residents only. The form will close at midnight PT on October 19, 2016. I’m looking forward to reading my daughters legacy. I loved Echoes of Titanic. Would love to win these books! 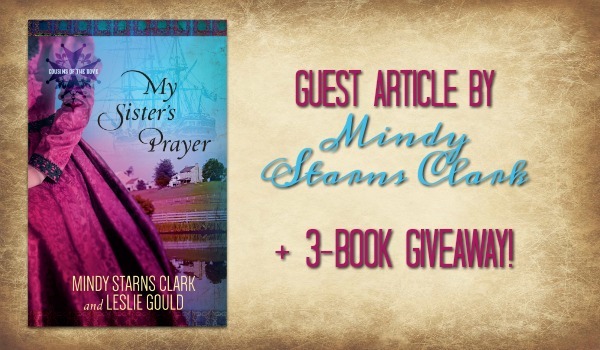 I’m afraid I haven’t read any of Mindy’s books, but I would love to win a copy of MY SISTER’S PRAYER. Thanks for the chance! I am looking forward to reading ‘My Sister’s Prayer’, but I plan on reading all of these. I enjoyed reading My Brother’s Crown and would love to read My Sister’s Prayer. Thanks for the opportunity to win! I have read Whispers of the Bayou some time ago. I enjoyed reading it. I would enjoy reading “My Sister’s Prayer”. Absolutely love your books. Thanks for this generous give away! Some day I would love to meet you in person! Thanks, Cheryl. You’ve been a faithful reader for a long time! I think this one looks really good and am eager to read it! I have enjoyed all of her books, looking forward to read her new one. I love her Women of Lancaster County books and I look forward to reading more of Clark’s other books as well. I’m looking forward to reading “My Sister’s Prayer”. As a French major in college and a former French teacher, I, too, enjoy learning about the French Huguenots and have explored places where they have settled in the United States. Perhaps it’s not just the displaced people that fascinate you, but also the concept of being displaced because of their faith. They are seeking to be faithful followers of God in the manner God has revealed to them. That is indeed an honorable cause. I love reading your books because they do examine worthwhile considerations. Good point, Suzanne. I think you’re right about the faith element. That’s a large part of what fascinates me about the Amish, how their faith and dedication drive so much of what they do, even to this day. My favorite book of yours is always the one I’m reading at the moment. I have read “Amish Midwife” and really enjoyed it. I’m looking forward to reading “My Sister’s Prayer”. I have not read any books by Mindy Starns Clark but they all look very good and I plan to put all of them on my book wish list for future reading. I love your books because of the intrigue & sharing your Christian faith. Thank you for offering the giveaway. Be thankful in all things. Read quite a few of your books can’t wait to read your new ones. I pass on my books to my younger sister and my Aunt. That’s great, Cathy. 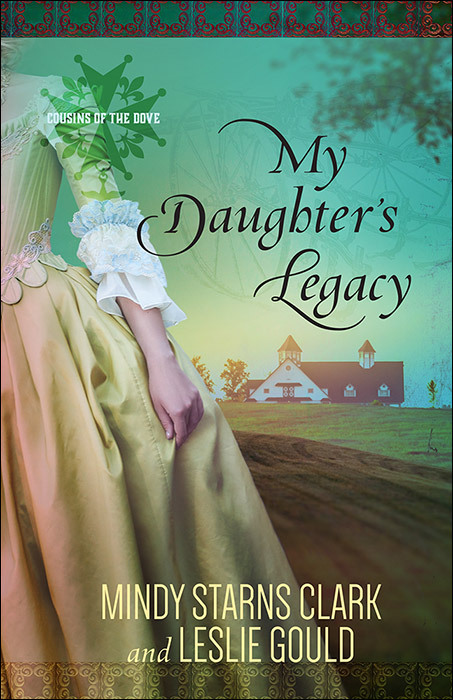 I love to hear about multiple generations of a family reading my books–probably because my mother and grandmother and I were always doing the same. I haven’t read any from this author, but if I did, I’d like to start w/the beginning of this series. I am looking forward to reading My Sister’s Prayer and getting to know this author and her work. Whispers of the Bayou is one of my most favorite books that I have ever read. I have yet to read one of Mindy’s books, however, I think My Sister’s Prayer and My Daughter’s Legacy both sound like books I’d enjoy. Thank you for the giveaway opportunity! I, too, enjoy books about displaced people finding hope. I have not ready any of Mindy’s books, yet, but certainly plan to add them to my “want to read” lists! Thank you for sharing your heart! Just started on the Women of Lancaster County series. Really enjoyed the Shadows of Lancaster County which was my first of your books to read. They are unusual and not like the typical Amish stories. Thank you for the opportunity to win one of your books. Love both of these authors, thank you for the chance to win a copy of their book. I would like to read, My Sister’s Prayer, as I am from Louisiana and I like anything written about my state. Thanks for the chance to win. I love the Million Dollar Mystery Series and I’m enjoying The Women of Lancaster County Series as well! I enjoy your writing and would enjoy reading and sharing this newest book. I have enjoyed other books by Mindy Starnes Clark and would really like to win these books. Thank you for this opportunity, crossing my fingers! First time on this site and I like what I see.